From about 300 feet in the air, the two workers strapped in atop a newly placed steel tower on a hilltop alongside Highway 101 looked completely at ease and unfazed by the fact that they were about to be taken for one hell of a ride. 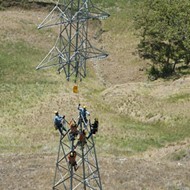 A DANGEROUS JOB : Pacific Gas & Electric crews are immersed in the second and final phase of the utility’s project to replace and upgrade a fleet of some 40 steel transmission towers and 132 wooden poles to lessen degradation caused by the elements and continue to meet the county’s growing energy needs. Hovering in place not far away, a Bell 500 carried members of the local media, who watched in awe as the two strapped their harnesses to the business end of a cable affixed to the underbelly of another helicopter and effortlessly leaned back as the chopper lifted them hundreds of feet and whisked them away to another remote location, unreachable by truck. The sight of helicopters ferrying massive transmission towers and the workers installing them has become something of a popular show alongside the northbound lane of the highway in recent months. It’s all part of Pacific Gas & Electric’s effort to upgrade vital power lines between Atascadero and San Luis Obispo. Construction for the $36 million project began in July 2011 and includes upgrading 70 kV transmission lines from Atascadero to San Luis Obispo, replacing 132 wooden utility poles with light-duty steel poles, and replacing 41 out of 45 steel transmission towers in the process. 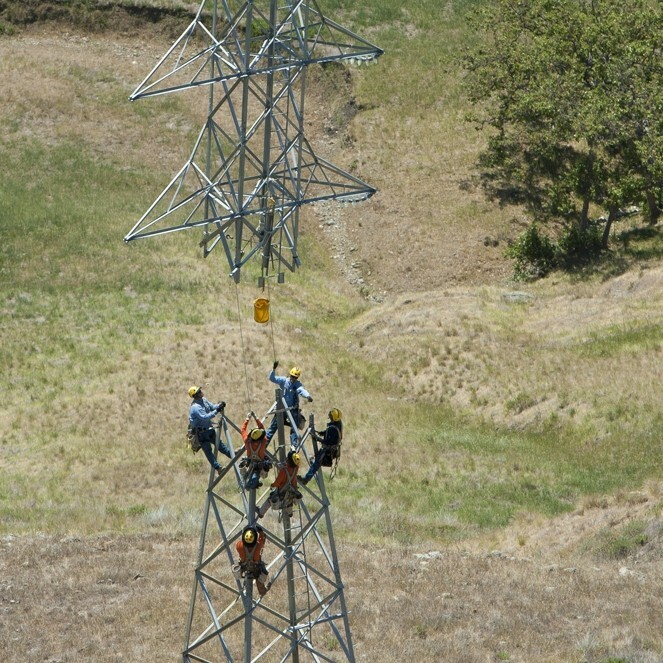 The first phase, which wrapped up last year, included installing new transmission tower foundations and tower bases along an existing 8-mile stretch of line from the top of Cuesta Grade to PG&E’s San Luis Obispo substation, and replacing four towers with tubular steel poles within the city of San Luis Obispo. 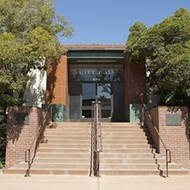 Crews also replaced about 60 percent of the utility’s existing wood poles—which are especially susceptible to fires—with light duty steel poles from the Atascadero Substation to the top of Cuesta Grade. 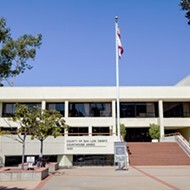 The final phase of the project involves replacing the existing steel towers and remaining wood poles, and then installing new lines along the 16-mile stretch from Atascadero Substation to the San Luis Obispo Substation. Multiple helicopters are being used to transport new towers and crewmembers to the various locations along the Cuesta Grade where ground crews will complete the installations. In addition, the new towers will be strung with new aluminum conductor lines, since aluminum weighs less than copper and is cheaper. 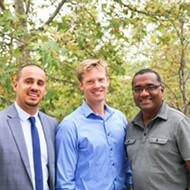 On May 10, two New Times reporters accompanied PG&E Spokesman Blair Jones and Meteorologist John Lindsey, along with representatives from four other media outlets, to the landing zone off Orcutt Road, a property leased to the company for the project by the Righetti family. 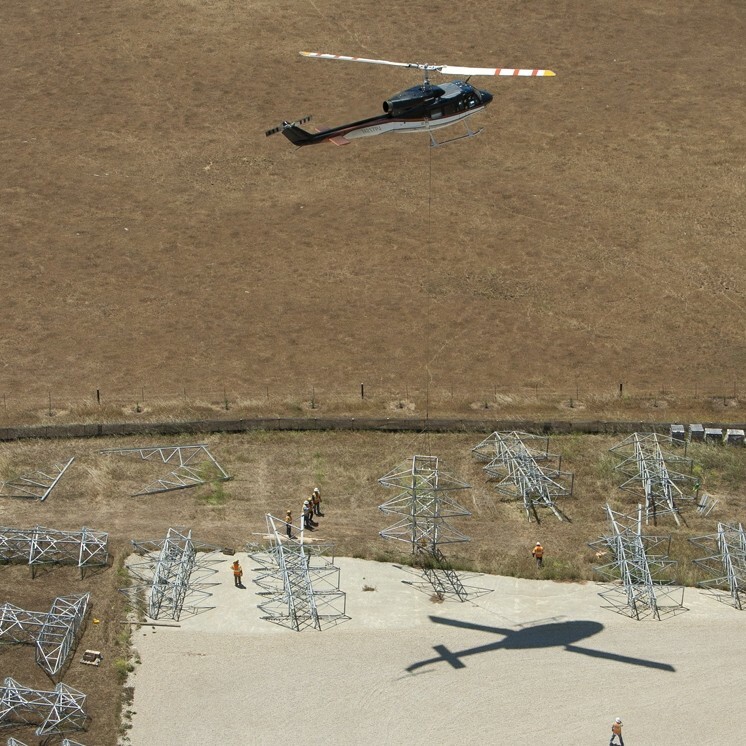 After a briefing on project logistics and environmental precautions, PG&E’s contracted helicopter pilots took members of the media for a ride over some of the remote locations where the towers were being installed. From the LZ, a Bell 214 long-range helicopter transported segments of the steel towers to the ground crews who waited, perched atop the already set tower foundations, to physically grab and connect the legs of the towers—by hand. Each tower weighs some 5,500 pounds. “It goes up just like an erector set,” Ellis said. There are many risks associated with the job, not only for the crews on the ground—or in the air, as the case may be—but also in the realms of fire and other environmental concerns, according to Pete Giles, an environmental inspector from Terra Verde Environmental Consulting, who’s been contracted by PG&E to ensure the utility is satisfying those concerns. Giles explained that in addition to his onsite observation every day of work, representatives from the California Public Utilities Commission—the state regulator for energy companies—make visits to the work sites about once a week to ensure workers are complying with safety regulations. He added that everyone working on site has completed environmental training during the wet season, and they conduct visual surveys for bird nests and signs of the California red-legged frog. 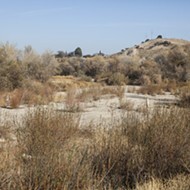 Workers must also comply with a host of other requirements to protect against erosion and fire, to avoid paleontological resources and areas that contain hazardous materials, and to limit air quality and fugitive dust issues. “There’s a lot of work and planning that goes into this,” Giles said. 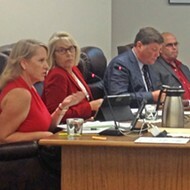 PG&E officials told New Times the project is about 70 percent complete and is expected to wrap up by the end of 2013.